(NationalSecurity.news) One of the jihadists who helped murder 14 Americans and wound scores of others at a holiday party in San Bernardino, Calif., last week had been in contact with an al-Qaeda-affiliated organization, as well as another terrorist group, the Los Angeles Times reported Friday. Citing an anonymous law enforcement source, the paper reported that Syed Farook had been in contact with members of the Al Qaeda-affiliated organization Nusra Front, as well as an African extremist group, Al-Shabaab. The official told the paper “some type” of contact between Fayook and those groups took place but details regarding the contacts are not yet clear. 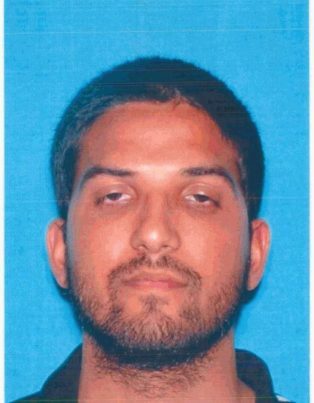 The report of Farook’s potential ties to terrorist organizations came after a Fox News reported which confirmed that his wife, Tashfeen Malik, had pledged allegiance to the ISIS terror organization via a Facebook post the morning of the attacks in San Bernardino. Both were killed by police hours after their rampage just two miles away. These developments confirmed the suspicions of many who believed from the outset the attacks may have been motivated by Islamic extremism. On Friday, in fact, the FBI announced it was treating the shooting as an act of terrorism. “This is now a federal terrorism investigation,” FBI Director James Comey said in Washington, D.C.
Malik, who was 29 and from Pakistan, continues to be somewhat of a mystery, officials said over the weekend. 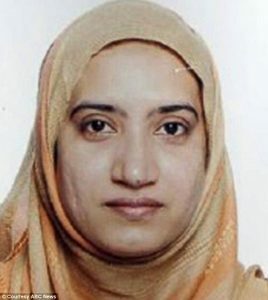 The FBI released a photo of her early Saturday. “Usually it’s ISIS supporters trying to radicalize young girls online as they try to find new wives, but this may be the first case I know of where the opposite happened,” Ryan Mauro, a national security analyst for Clarion Project, which tracks international terrorism, told Fox News. The UK Daily Mail reported that Malik was linked to Pakistan’s most notorious radical cleric and mosque, one that is known to be a hotbed of Islamic fundamentalists. In a separate report, the paper said friends and relatives noted that Malik had begun to wear more conservative Muslim dress for women about three years ago, adding that Pakistan does not have a dress code for women. Farook is a third-generation American whose family has ties to Karachi, Pakistan. His brothers said he was a devout Muslim who recently memorized the Koran. Separate reports said that San Bernardino County, whom he worked for as an inspector, accommodated his religious beliefs and allowed to go home to pray several times a day, without penalization.